HomeHas This Become A “Short Everything In Sight” Market? Has This Become A “Short Everything In Sight” Market? One of the strangest things about this strangest-ever expansion has been the way pretty much everything went up. Stocks, bonds, real estate, art, oil – some of which have historically negative correlations with others — all rose more-or-less in lock-step. And within asset classes, the big names behaved the same way, rising regardless of their relative valuation. This seemingly indiscriminate buying created a paradise for index funds that simply accumulate representative assets in their chosen sectors. And it made life a nightmare for the higher-order strategies of hedge funds that get paid to beat the market. The cause of all this, of course, was the tsunami of new currency being created by the world’s central banks and dumped into the banking system. It had to go somewhere and ended up going everywhere. Stocks, bonds and commodities from copper to crude oil to burlap are staging a rare simultaneous retreat, putting global markets on track for one of their worst years on record and deepening a sense of unease on Wall Street. By one measure, global stocks and bonds are both on track to finish the year in the red for the first time in at least a quarter-century, said Belinda Boa, head of active investments for Asia Pacific at BlackRock in Hong Kong. Major stock benchmarks in the U.S., Europe, China and South Korea have all slid 10% or more from recent highs. Crude oil’s tumble has dragged it well into bear market territory, emerging-market currencies have broadly fallen against the U.S. dollar, and bitcoin’s price—which had a meteoric rally last year—crashed below $5,000 this past week for the first time since October 2017. Havens such as U.S. Treasury bonds and gold rallied this fall as U.S. stocks and industrial commodities staged their fourth-quarter swoon. But both are still down on a price basis for the year, reflecting solid economic growth and tighter Federal Reserve policy that have begun to push interest rates out of their post-financial crisis doldrums. 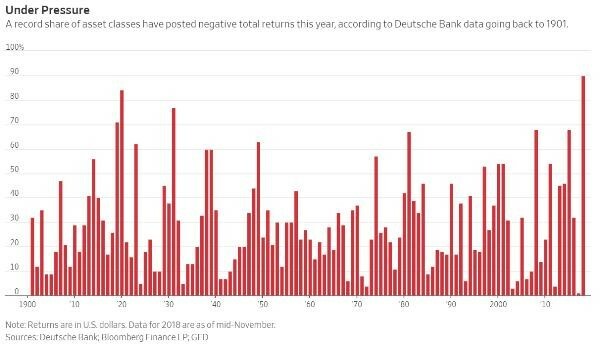 All told, 90% of the 70 asset classes tracked by Deutsche Bank are posting negative total returns in dollar terms for the year through mid-November, the highest share since 1901. (The S&P 500 is up slightly in 2018 on a total-return basis.) Last year, just 1% of asset classes delivered negative returns. The broad pullback in markets is leaving fund managers scrambling to find places to park their money. But with global growth showing signs of slowing and monetary policy expected to tighten further, few are eager to place large wagers and risk compounding earlier failures to generate expected gains. Indeed, the simultaneous failure of so many investment strategies is being by viewed by some as a warning of what could come following years of above-average returns. Few investors believe a recession, particularly in the U.S., is imminent. Yet the strength of the U.S. economy has allowed the Federal Reserve to continue stepping further away from the regime of rock-bottom interest rates and bond-buying put in place after the financial crisis. That has, in turn, diminished the premium investors get for taking on risky assets, pressuring a variety of markets. Hedge-fund manager Pierre Andurand, who earlier in the year bet oil could soon hit $100 a barrel, saw his $1 billion Andurand Commodities Fund suffer its largest monthly loss ever in October. Funds that had built up large stakes in fast-growing technology companies were also stung by sharp reversals. Twenty-six funds dumped their entire stakes in FacebookInc. in the third quarter, according to a Goldman Sachs Group analysis of 13F filings, including billionaire Daniel Loeb’s Third Point LLC, which offloaded 4 million shares, citing “a very disappointing quarter” for Facebook. This shouldn’t come as a surprise, since virtually every asset class except for precious metals started the year at “priced for perfection” valuation levels that have always in the past preceded some kind of crash. It’s just more widespread and homogenous this time. So now all the geniuses who bought the big names in random categories and made easy money are wondering why every single thing they do is suddenly wrong, while the handful of remaining short-sellers are finding that whatever they bet against goes down. This kind of wide-spread angst ought, if history is still a useful guide, lead investors to start discriminating again, with safe havens like gold and high-grade bonds getting some of the attention that tech and cryptos have hogged recently.